In this paraphrased line from “New York, New York,” Frank Sinatra summed up the role the Big Apple has played for superheroes across comic book history. (Sinatra was possibly himself a mutant with those freakish blue eyes.) After all, the vast majority of tall buildings a hero might leap in a single bound are located in New York City – or at least based on a real-life counterpart. For the record, Peter Parker is a Mets fan and Wolverine lives and dies – and is then regenerated – with the Yankees. Long before it became Marvel Comics, Timely Comics’ Captain America got his start as the spindly Steve Rogers on the lower East Side of Manhattan; Batman creators Bob Kane and Bill Finger put the Caped Crusader in the alleys and dark-lit backstreets of New York City, before National Publications (later to become DC) opted for a move to fictional Gotham; Fox Comics’ Blue Beetle was the son of an NYPD cop. Then Stan Lee, Jack Kirby, Steve Ditko and the rest of the Marvel crew unleashed a comic book store shelf full of super-powered New Yorkers in the early ’60s. Spider-Man hails from Forest Hills, Queens, while the Fantastic Four’s Baxter Building got its mail delivered to 42nd Street and Madison Avenue, ensuring that Galactus, Doctor Doom and Mole Man were regular unwelcome visitors to Manhattan. Another 42nd Street local (from an era long before Times Square looked like Disneyland), Luke Cage plied his trade as a hero for hire above a run-down movie theater that only played westerns; not too far away, Daredevil patrolled Hell’s Kitchen. 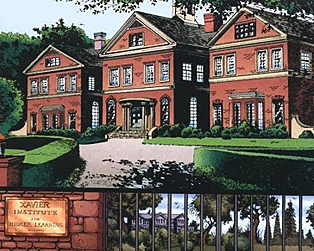 Even Charles Xavier’s School for Gifted Youngsters had its campus – complete with cutting-edge jet under the swimming pool – just a short commute into suburban Westchester. 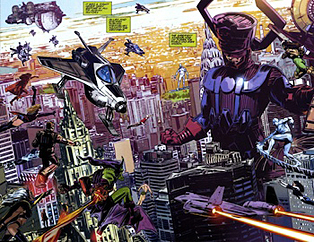 Lee and Kirby also dropped the Avengers mansion on Fifth Avenue and 70th Street in Manhattan, home of the real-life Frick Collection. Doctor Strange’s Sanctum Sanctorum can be found at a Bleecker Street address where Roy Thomas used to live in the 1960s in real life, according to The Marvel Comics Guide to New York City. (For the record, Peter Parker is a Mets fan and Wolverine lives and dies – and is then regenerated – with the Yankees). But even Gotham City and Metropolis have always just been “New York stand-ins,” says Danny Fingeroth, author of Superman on the Couch: What Superheroes Really Tell Us About Ourselves and Our Society. They were just given fictional names with the rationale that kids around the country would feel less excluded if the settings for Superman and Batman’s adventures were more generic, he says. There’s more: Before DC rebooted its universe with the New 52, J. Michael Straczynski had Wonder Woman living in New York City. Both Richard Donner’s Superman and Christopher Nolan’s The Dark Knight Rises were also shot in NYC, as the Big Apple is a good stand-in for both Metropolis and Gotham. “It was very gratifying to go to, as you said, the spiritual home of Gotham and get that on screen,” Nolan told Unwinnable in July. There’s no major secret origin story behind all of this: the city has been the center of comic book publishing from the days when Famous Funnies ushered in a new medium in 1933. The companies were all here, giving a chance for the Will Eisners, Joe Simons, Jack Kirbys and Joe Kuberts to escape their Depression-era hardscrabble lives and make a mark on history. As an American Jew frustrated about the headlines coming out of Nazi Germany in early 1941, Joe Simon dreamed up the idea for his and Jack Kirby’s signature creation, Captain America, while riding a bus down Fifth Avenue. 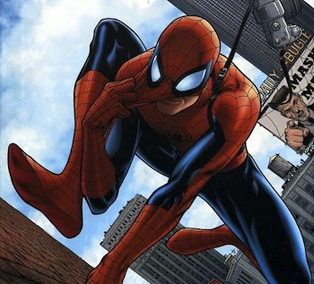 These days, the biggest name artists and writers in the business are spread all over the globe, but New York City remains entrenched in comic book lore – it’s hard to imagine Spider-Man ever leaving Aunt May behind for a new life in Duluth. “I think just as in novels and movies, the New York of the comics was this imagined place where dreams could come true, the symbolic representation of the best and worst of America and of humanity,” says Fingeroth, who is also vice president of educational programs at the Museum of Comic and Cartoon Art in New York. Sinatra couldn’t have sung it better himself. Ethan Sacks doesn’t have a secret NYC identity @ethanjsacks.